Crime syndicates are able to cheat people of their land through fraud and forgery because of weaknesses in the conveyancing process. It’s time to clean it up. LANDOWNERS beware – especially those whose lands are vacant and idle, who are based overseas or are elderly. Your title to that property can easily be stolen because any one of the key players in the conveyancing process – the Land Office, legal profession or the lending bank – may lack integrity or don’t observe the proper verification procedures. According to police statistics on fraud and forgery cases involving land since 2005, there were 34 cases in 2005, 66 in 2006, 74 in 2007, 113 in 2008, 111 in 2009 and 37 in the first quarter of this year alone. 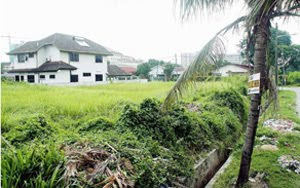 For almost a decade, the rise in the number of cases was blamed on the change in the legal position of whether it is the original land owner or the innocent buyer who has a better title under the National Land Code (NLC). But in January this year, a different Federal Court decided in Tan Ying Hong to restore the position to deferred indefeasibility. But are land owners and banks more secure now from fraud? Based on fraud cases in Malaysia, the syndicates like to target vacant and idle lands, land owners based overseas and those who are elderly. All an enterprising crook needs are loopholes in the law – unsuspecting landowners; corruptible people; commissioners for oaths, lawyers, bank officers who take a lax attitude in the verification of identities, signatures and original documents; and Land Office staff who register dealings relying on court orders without verifying their validity because they are not required to do so. Include a land registration system that doesn’t require Land Office staff to verify information from an applicant to register a transfer of ownership, and what we have is the perfect set of circumstances for fraud and forgery to thrive. National University of Singapore Assoc Prof Dr Tang Hang Wu does not think the Adorna decision was responsible for the rise in fraud. “Singapore is a jurisdiction which subscribes to immediate indefeasibility (as in the Adorna case) and the instances of fraud are far fewer than in Malaysia,” he states. While the concept of deferred indefeasibility may make it harder to commit fraud, the practical and mundane aspects of the conveyancing process are more crucial to preventing it, he adds. The higher incidence here, he says, is due to the presence of “sophisticated and organised crime syndicates” that engage in identity theft. Malaysian lawyer Andrew Wong adds that in most of the cases here forgers assume the identity of the land owner, create fake identity cards and forge signatures. To reform the conveyancing process, Dr Tang and Wong say the following need to be addressed: the integrity and professionalism of the Land Office and the legal profession; attestation clause; identification and verification procedures; rules regarding the holding of conveyancing monies; and procedures relating to replacement of lost certificates of title. Referring to a 2004 news report about some Selangor Lands and Mines Department staff being implicated in fraud involving land worth RM130mil, Dr Tang says the Land Office must purge itself of criminal elements as it is the principal bulwark against fraud. He stresses the importance of training Land Office staff to detect any red flags. In applications for replacement certificates of title, he suggests that the officer insists the applicant turn up in person for an interview and provide a thumbprint and photograph so that it would help with evidence-gathering if fraud occurs later. He points out that attestation in New South Wales, Australia, and authentication of documents in Botswana require the person attesting a signature to “personally know the person signing”. Wong adds that in Singapore the registrar may reject any instrument unless a Certificate of Correctness is included. This certificate, signed by a solicitor employed by a party to the instrument, implies, among others, the instrument is made in good faith and the matters set forth are substantially correct. Former Bar Council Conveyancing Practice chairman Roger Tan, however, doubts whether introducing such a certificate here would reduce fraud. “A certificate would impose personal liability on the lawyer but the crooks can still forge the lawyer’s signature and the certificate itself,” he says, adding that in many cases the crook had the help of a lawyer or Land Office staff. He reckons that making it mandatory to use thumbprints on transfer forms and creation of charges is a better way to reduce fraud. As for how to prevent lawyers from absconding with money (meant for buying a property) deposited in the client’s account, Dr Tang says there is currently a proposal in Singapore for all such monies to be held by its Academy of Law or commercial banks for safekeeping. With regards to reducing risks to lending institutions, Wong says they should be required to take reasonable steps to confirm the identity of the borrower or the security party, and to maintain records of such steps for at least seven years. Wong and Dr Tang also suggest that an Assurance Fund be set up to compensate victims of land scams. Wong thinks that title insurance – a no-fault indemnity insurance which exists in several Commonwealth countries and throughout Europe – should also be introduced here. No reform should be rushed into but they should address all the current weaknesses. It should be remembered that criminals are not encumbered by bureaucracy and that they adapt very quickly to whatever the authorities come up with. In the mean time, all the stakeholders can work on improving their personal integrity and shoring up incorruptibility. IMMEDIATE indefeasibility is a situation where a transferred title is valid, regardless of any element of fraud or forgery involved. Countries such as Australia or Canada practise this, and their respective governments have in place a fund that compensates victims of such cases. Deferred indefeasibility, on the other hand, only protects a subsequent purchaser to a title that is defeasible. Therefore, if one party obtains a title where fraud or forgery is involved, this title can be defeated. However, if this same party sells it to another purchaser who buys it on good faith, that title is considered to be indefeasible. The indefeasibility therefore “defers” across one transfer of title (the one where fraud or forgery is involved) to the next purchaser who buys it in good faith. Prime Targets: Based on fraud cases in Malaysia, the syndicates like to target vacant and idle lands of land owners based overseas and those who are elderly. IMAGINE looking through the “land for sale section” of the classifieds in your newspaper and finding an insert put up by someone else offering your property for sale. Then imagine seeing the same insert week after week. This is what has happened to businessman M. A. and two others who are co-owners of five parcels of freehold land in Cheras, Kuala Lumpur. In January, they went to the Land Office and put a caveat on the titles to warn prospective buyers that the parcels, measuring 17.35ha, were not for sale. That, however, did not stop property agents from advertising the parcels, zoned as agricultural land, for sale. The only effect is that many have written to M. A. saying they have prospective buyers lined up either for individual parcels or the whole lot. Last month, the owners approached the Bar Council with their problem. On July 12, council secretary George Varughese issued a circular to all members of the Bar informing them of the situation and to advise them to exercise caution if they were approached to handle any transaction involving the properties. M. A., who has declined to be identified, says his discovery of the attempts to defraud him and the two other owners of the land last year happened by chance. “A family friend who is an estate agent had seen an ‘Option for Sale’ document with my name indicating the lots were for sale and called me,” he relates. How indeed, especially since he says he only got his MyKad five years ago and the only time he used it was at the Immigration Department. “They also had certified true copies of the titles,” says the perplexed and angry M.A. “How is that possible when the titles are with us? The fraudsters were interested in the parcels – of which four are adjoined and the smallest, a short distance away – because of their development potential. Interest was especially high just before the 2010 Budget in October which re-introduced the real property gains tax. The interest is still there as they found a man surveying the land earlier this year. Before they ejected him, they managed to get the information that a “Datuk Tan” had sent him to survey the land. M.A. says he is getting more and more concerned, especially since he’s been told that the caveat they had put on their titles was of no use. All it takes, he was told, was for someone to get a Commissioner for Oaths to witness a statutory declaration and the caveat could be removed! Furthermore, the response to the council’s circular was disturbing, to say the least. Two lawyers have said they had clients who had been approached to buy the property. According to M.A., one reported that the “vendor” had a power attorney – attested by a Commissioner of Oaths – that authorises him to sell the land. The second lawyer reported that her client had deposited two per cent earnest money with her. The interesting thing is that no lawyer has come forward to say he or she has acted as counsel for the purported vendor. “Look at this!” M.A. says, pointing to the classified section of a newspaper dated Aug 4. Another agent – unauthorised by the owners – was offering their property for sale. The owners have put a caveat on their property titles; M. A. has lodged a police report, reported the matter to the Bar Council, chased off a surveyor who entered the property without permission, and pulled down “For Sale” signs posted on the site by unknown persons. How much more diligent can an owner be? Published in The Sunday Star on 08 August 2010. A good warning for everyone. I'm sure that a lot of people have fallen for this scam already. Reading this, it gave me ideas and knowledge on what to do, so that I can be more careful against these cheaters.